A stylish vase containing 1 packets of highly prized Turri Saffron. This product is guaranteed by Itria, the leading name in the production of Italian saffron. 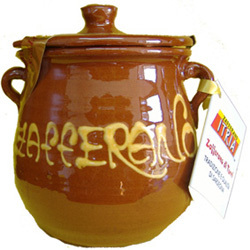 Turri saffron is an authentic and prestigious Italian product. It is highly aromatic and utterly natural, containing no colourants or preservatives. Just open one of the packs and you are sure to be enveloped by the intense aroma. Italy´s untainted farmland provides the ideal climate for the cultivation of saffron, and the expertise of a major name like ITRIA guarantees the high quality of the product. When preparing dishes, add a dash of Itria saffron just before you have finished cooking. Dissolve the pieces in a small amount of hot water and then pour onto the dish. Each pack contains the right amount for 3-4 servings. This product can be stored for at least two years.